This is a common question from new 9N-2N and early 8N owners. 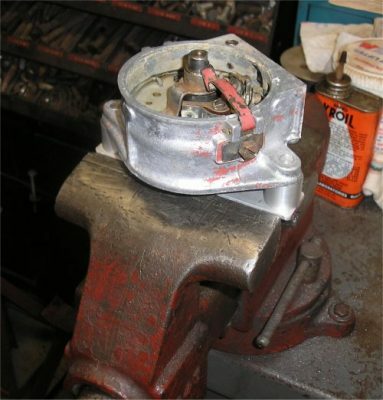 The front mount distributor engine has no external timing marks. Instead, the timing is set mechanically with the distributor out on the bench. The drive tang on the back end of the distributor is offset and it fits in an offset slot on the front of the camshaft, so you cannot get the distributor installed wrong. 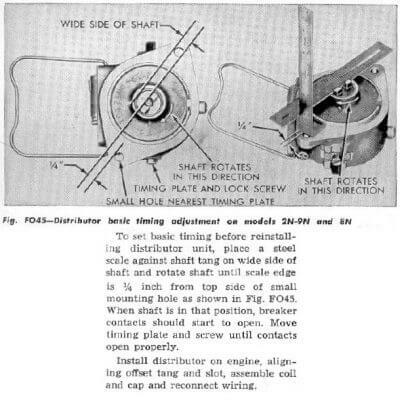 Here’s a scan of the static timing method from the I&T FO-4 shop manual. This method will work fine, but once you’ve tried it you find out right away that holding the rulers and checking for the points opening and moving the plate to the correct position is nearly impossible to do without having 5 hands available. Some people make a plug to fit the bolt hole with a larger OD so you only need one ruler. This is still a hassle and you need at least 3 hands to get the job done. We have made a simple fixture that makes the job much easier. 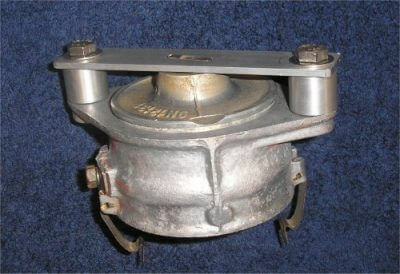 It consists of one piece of aluminum flat stock and 2 machined plugs to fit the bolt holes on the distributor housing. The flat stock is machined to have the slot in the correct location, same as it would be with the ruler method. The 2 bolts attach the flat stock to the plugs. 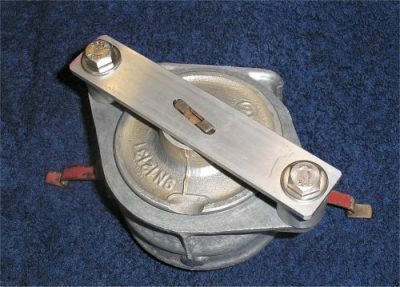 The 2 holes on the distributor housing are different sizes, so when the plugs are machined to the correct size for a snug fit the fixture cannot be installed the wrong direction. Here it is installed on the distributor. The snug fit will allow the distributor to be held firmly in the correct position and it’s rigid enough to clamp in your vise while you adjust the points plate to get the “just open” position you want. A continuity tester, ohm meter, or test light works better than eyeballing it. If you’re not able to build something like this yourself (and many can’t because of the machine work required) check with a friend who can do it or a local metalworking hobbyist who can make you one. It’s well worth the trouble.